Usama H. Ghazi, D.O. was inspired to pursue a career in the medial professional after his twin brother was hospitalized with kidney trauma when he was in the third grade. He began reading up on the kidneys and gained an interest in the field of medicine. 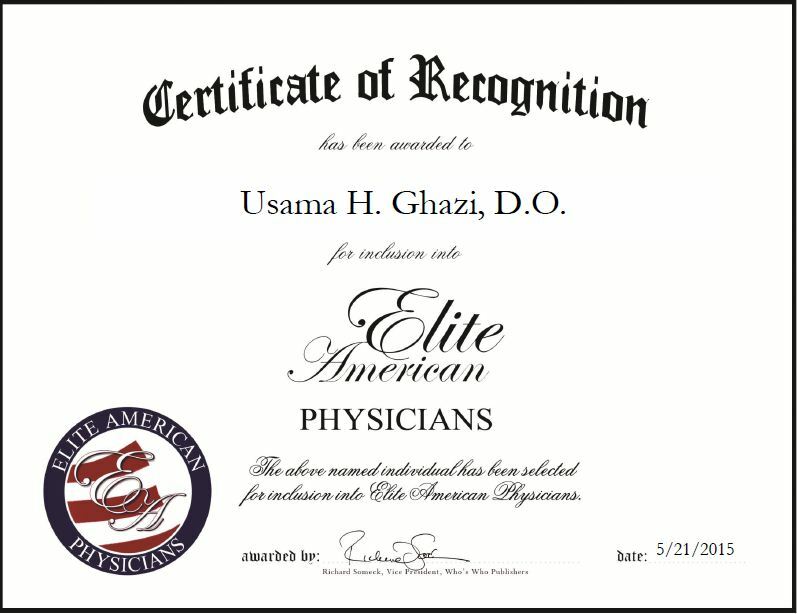 Dr. Ghazi has been a practicing physician for more than a decade. He has extensive experience in spine and sports medicine and regenerative medicine, and works with patients who have peripheral nerve blocks from amputation pain, chronic regional pain syndrome, chronic post-operative pain in the extremities, pelvic and gynecological pain for women, and patients seeking his care for chronic inflammation and muscle pain. Dr. Ghazi spends his days treating and diagnosing patients. He also performs electrodiagnostic and nerve conduction studies, as well as interventional injections under flouroscopic guidance in the lumbar, thoracic and cervical regions of the spine. Dr. Ghazi has Level II Full Accreditation from the Colorado Division of Workers’ Compensation, and has received numerous accolades for his work, including being named one of the Top 10 Doctors in the state of Colorado. Dr. Ghazi attributes his success to a hard work ethic and his parents’ support. Looking toward the future, he expects to continue to teach medical students, work on a few publications and detail the utilization of peripheral nerve blocks. Contact Usama H. Ghazi, D.O. This entry was posted in Osteopathic medicine and tagged nerves, pain management, Physiatrist, regenerative medicine, Spine and sports medicine. Bookmark the permalink.